From the April/May (number 130) issue of Professional Boatbuilder magazine. Worth reading if you get the magazine. by Eric Sponberg A naval architect has reservations about the culture he found in Internet boat-design forums obsessed with finding easy answers and instant gratification." Internet boat-design forums obsessed with finding instant answers and easy gratification." A bit like life in general ,a decent BS detector can be a life saver . I have to admit to liking multiple source confirmation ... personal first , books second and the net thirdly . Some of these are not actually NA's but actually Boat Designers, which is different. I have seen some spectacular screw ups by degree holding Naval Architects during my career. Although I taught myself and learned on the job, I managed to get through a whole career (three months from getting in my boat and going off the grid, I guess I can say that now) without embarrassing myself. Eric's comment applies equally to the whole Internet. As for experts, I've spent a lot of time during my career sitting in meetings listening to experts on one side of a table saying one thing and people with equal knowledge and experience on the other side saying something exactly opposite. Internet forums are a mixed bag for certain but if you hang around long enough you develop a filter that can sort it out. Unfortunately too many beginners look at it as the first, and sometimes only, source of information. That and reliance on computer CAD without understanding are two main problems. Still, it is not really different from before when we always had the blind leading the blind. The filter you're talking about is I believe a modicum of research, study and a handful of experience thrown in. Enough to make you dangerous as they say. Just know that you don't know it all and you can sort out what you need from the masses of info out there. And besides, mistakes happen right! Last edited by Hwyl; 04-14-2019 at 07:21 PM. I have followed such exchanges on boat design forums and have seen what I consider to be the helpful, the questionable, and the personal comments. That is what you get when people get together to trade opinions. Nothing exceptional to me. I have enjoyed Eric's comments; you do see amateurs seeking quick answers.. I have seen an expert go after a lesser credentialed poster with harsh criticism, but figured that most readers know when the criticism is warranted and when the comments just lower others' opinions of the poster. As has been said, some independent research and experience is helpful as a BS detector. Whats his issue? Not getting enough work because of the forums. Easy answers and instant gratification? Insane. Look at the quality of work you guys do. It's only as dangerous as the reader is stupid. Sounds like congress needs to pass bill to ban forums. Rank it in importance with the child drowning on the spackle bucket warning or banning smoking in pool halls. Without reading the entire article, I can't comment on the author's individual stake in all this. I would say that the internet is a double edged sword. On one hand, we have instant access to a very wide range of information on almost any subject there is. The problem is that the internet has no vetting system, so there is no way of knowing what is good information and what isn't. When someone publishes a paper in a journal, or a book that expands our knowledge of a subject, that opinion becomes available for a real critique by the appropriate peer group. The internet has a huge range of information that is absolutely worthless, and yet it is touted as reliable, simply because no recognized peer refutes the post. Evidence of that problem arises here all the time. Sadly, it also drives away reputable people from internet forums because they don't want to argue with the idiots. I like to think I have the cognitive skills to recognize good from bad, but that suggests that I might have a foundation in whatever knowledge I am seeking. Sometimes that isn't the case. In the end, there are a lot of people who don't do anything particularly well, and they're proud of it. If you leave the word "boat" out of it, for a moment, any design is a solution to a particular set of problems. Those schooled, solve new problems with old solutions and have to defend their knowledge base. The untrained,on the other hand,have the freedom to explore any option, and the "possibility" exists for a creative solution. I don't trust anyone you can smell the library dust off of. The abuse and rudeness is seldom if ever really warranted. I do not think anyone is bothered by a negative comment. "I think bla-bla which is contrary to your statement, and think it for the following reasons",......you can have a frank discussion without being abusive. "you are an idiot and know nothing of what you speak, and should shut up....."
These people diminish themselves.....If we put up with that behavior it becomes normal. I am not interested. A) Good on you Peter, and go for it. 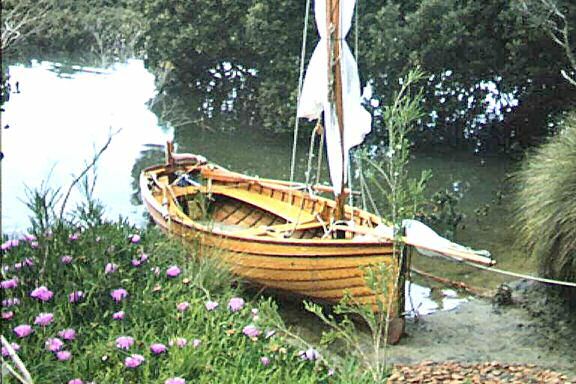 Visit us to see how we help people complete classic boats authentically. I, personally, am very thankful that design forums exist. I have hung around here for over a decade and have enjoyed almost every minute. I am also thankful that smart, educated, intelligent designers also choose to contribute here. The way I filter out what is BS is to only act on the advice of people who have never had anybody disagree with, or prove wrong, any advice they have put forward, and usually I can confirm what they have said with my meager library . Like Peter said above, multiple source confirmation is the ticket for me too. However, I will always at least consider most of the rest. Some people will have flashes of brilliance at times and I think they shouuld be given due consideration. Generally speaking though, if it's something I have not heard here, from the people I personally respect, I usually ignore it. I need this place because, really, I am not that good at this boatbuilding thing but I do enjoy it greatly. I would never presume to advise anyone though. I would never try to design a boat on my own. As far as the attitudes of some designers and people who aren't designers but do think they are, well, what I see is that the people who aren't but think they are, are usually the most rude and the ones who actually are and do know what they are doing are just down right mean sometimes to people who are less, lets say, educated in the ways of building boats, of which I am one. Here a while back when all of the talk about the bilge was going on ( I personally think the bilge should not be here ) a guy wrote me a pm about his views on it and I wrote back and somehow got into how some of the people here are what I termed "elitist" and were very rude to people who were less knowledgable than themselves and that I thought that that was not the way the woodenboat forum should be. Well, he has not responded to any further pm's from me, not even about non-bilge related matters. I think he got mad. I told him though that I did not consider him to be turned that way and that I always thought that he was always polite and helpful to newcomers and people who needed help, even when they had a repetitive question, as newbs sometimes do. Many of you who have posted to this thread are among those who's opinions I hold in high regard and are those who I am greatful are here because you are the ones who generally seem to know what you are talking about and above all are usually very helpful, aren't rude or have a big head. Hope you are always here. Just remember, an ex-spurt is just a former drip under pressure. Last edited by peter radclyffe; 03-20-2011 at 10:04 AM. At a certain level he is almost certain to be correct. Of course there is an abundance of nonsense. Technical people of the right sort get put out when one error comes across their desk, let alone a few hundred per page. "They are a mixed blessing for sure, too many who are prepared to put forward opinions that have little basis in fact but which they present as being from an authoritative source." Unfortunately that describes quite a few well known boat designers of the lifetime of knowing what works school also. In some rather prominent cases. There has been a convergence of the coming to market of new design technology that some older designers have been slow to adopt: with, the emergence of new boat design regs in places like the EC; and some other stuff. It has been a bit like Toto pulling back the curtain. There must be designers working for larger companies, with actual engineering budgets, etc... Who work in different way and may be legitimately concerned about the back of the envelope (best case) scene. There may be truth in the man's statement, but I feel it is a narrow view. I read books on boat building, and prowl the internet which contains lots of info outside of forums. What a forum offers is opinions - lots of opinions, and experience which many are willing to share. My building space available limits me to under 18' boats, and in that size I prefer the status quo, which is wide open freedom to totally mess up with a crappy design or build. One of last frontiers available for those of us who are borderline mad. So your creation doesn't work as planned - hey, bet you had fun building it. My darling daughter expressed a fear that she might break the Cat I built her, and I said, "It's wood, we can fix it, or burn it and build a better one." But I confess to being biased. On the whole I think the exchanges here are on a very useful plane, and while there may be frequent disagreement in respect to "what is best" chaff doesn't stand for long. As a corollary of that, I have learned more here by being wrong than by being right all the time. I think punk answers don't stand for long. When the forum is working at it's very best, one might even expect a quiet nudge in the form of a PM from a better informed member. I think the comment may be true, but doesn't grant enough intelligence to most readers. People are able to figure out the better advice as a rule, I think and that makes places like this very useful indeed. Agree completely Lew - the NZ CYA forum is bloody useless as a resource / help source, I have gathered so many useful tips & sage advice on the WBF. You just have to put the bull_ _it goggles on at times. "Old boats are like teenage girlfriends: there is a certain urgency to their needs & one neglects them at one's peril"
I have a number of good friends who are Naval Architects, and a few others who are Boat Designers. The rudeness is not a character flaw shared by the whole profession. The problem, in arrogance among pros, is that they have the tendency to defend their decisions with "who the f--- are you to challenge me",instead of defending the individual action. It is a universal problem, evident in all trades,and not likely to resolve itself,in the near future. Good Grief ....why would they do that ? Someone who actually knows how to fix their toys !! I'll bet fishermen don't sneer...they're too interested in talking you into a cheap repair . Well, ain't this a minefield of a topic!! Yes, some NA's are arrogant, just as some boaters & boatbuilders are woefully ignorant. Both sides have no shortage of stubbornness. But to focus on one reason why most of these design threads go awry, why-oh-why must people of both stripes feel obligated to denigrate the aesthetics of a design that doesn't suit their notions of what constitutes a beautiful boat? If the design is seaworthy, safe, and the apple of the owner or designer's eye, it is a fine design whether it is a Bolger Plybox or a radical superyacht. It is perfectly acceptable - even encouraged - to discus the form, function and engineering of a vessel design in civil discourse, but why do some folks feel the need to denigrate what they don't like or don't understand? And a shot before I crawl back under my rock - Naval Architects are no more needed to design boats such as that pretty rowboat pictured in the post above by Wooden Boat Fittings than seat-of-the-pants engineering is what is needed in designing a radar and communications mast on an ocean-going ship. (Here comes the NA arrogance...) If you don't understand why, then you do not know enough about the subtleties of both to venture an opinion. Ask questions, read, learn of course, but keep your scathing opinions to yourself until you understand the subject as well as the designer does. "Why do you have to study architecture to know about belly buttons?" Too late... it seems, much to my dismay, that it has indeed become normal. Rare is the person these days who is constitutionally able to engage in an honest, respectful but geniune and deep disagreement. The internet certainly is no help in that regard. It's easy to be a flaming a$%hoo(e when you're completely anonymous. I think these are words to live by, I'm still practicing. OTOH, the schooled benefit from learning the amassed knowledge of many who have gone before them and who have taken the time to preserve and convey that knowledge to others. Perhaps the most important knowledge passed along is what does NOT work - and why it doesn't. Yes, experience is a great teacher - provided you're still alive after the experience to have learned from it. The "creative" newbie revelling in the "freedom to explore any option" might, , in many cases, do well to learn from the mistakes and accumulated knowledge of others. There were legitimate reasons for the old guild/apprentice/journeyman/master system.